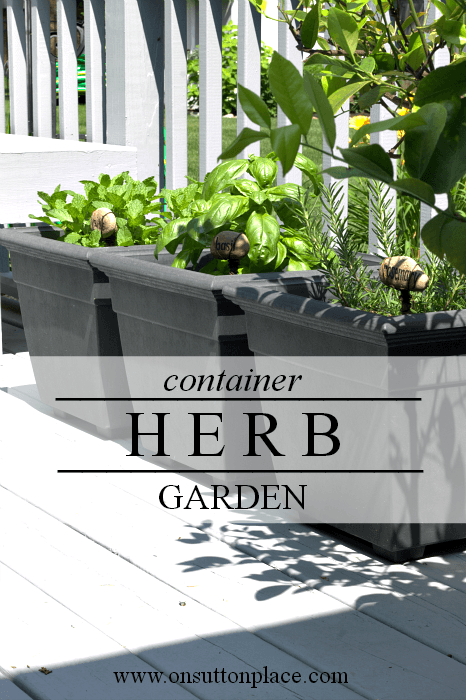 Ideas for planting a container herb garden and tips for using the herbs in your kitchen. Easy inspiration for a beginner gardener who wants to start small. If you are a beginner herb gardener like me, you are in the right place! I have inspiration to get started, ideas for plants, and suggestions for ways to use the herbs in your kitchen. A container herb garden is a budget-friendly and super simple thing to do, yet it yields great rewards. All you need are a few pots, some good soil, and healthy plants. *Affiliate links are included. Click HERE for my disclosure statement. Any kind of containers will work for an herb garden. I’ve had these black pots for a few years and although they are still usable, they have faded quite a bit. I would love to use vintage galvanized buckets or even enamelware so maybe that will be the plan for next year. Due to the size of my containers, I used one plant per pot. Just fill the pots with soil, plant the herb, and water in well. Click HERE for similar square black planters. 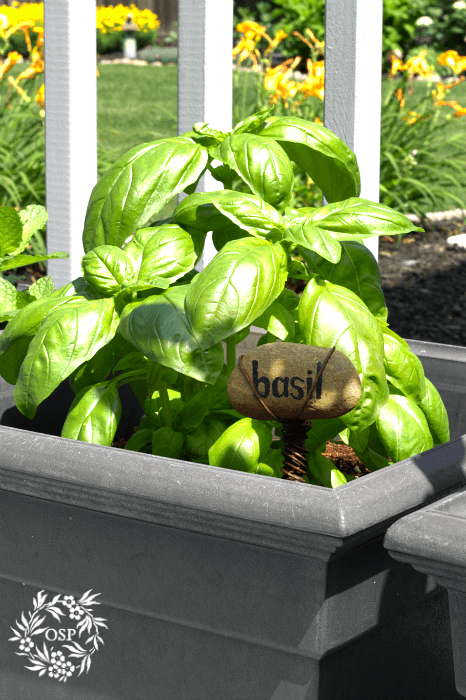 The herb every garden should have is basil. No matter what the conditions, basil grows well and gets huge. This year the leaves on my basil plant are huge! I love cooking with basil and the bigger the leaves, the better. One of my favorite dishes to make is Honey Mustard Grilled Chicken. This is a favorite of my family and appears on the menu several times over the summer. Next up is rosemary. I love it…especially the way it smells. I like to cut the longer stems and put them in a small pitcher by my kitchen sink. It’s the best kind of aroma therapy! My go-to summer side dish is Rosemary Potatoes that you can find at the link above. The smell of rosemary fills your kitchen and it gives the potatoes such a wonderful flavor. 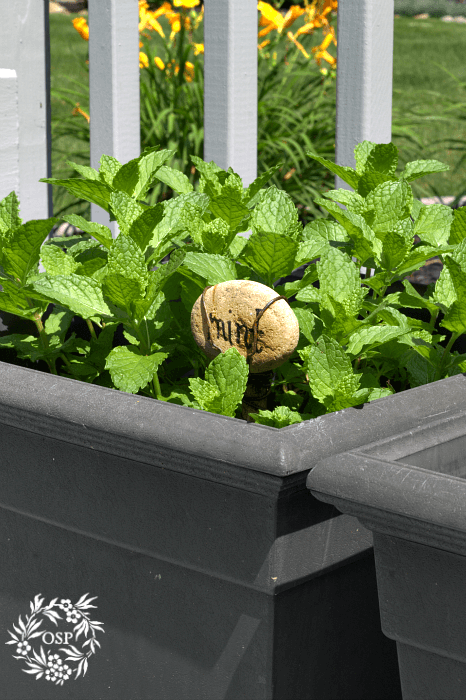 The last must-have plant for your container herb garden is mint. I enjoy being able to go out and cut a few fresh stems whenever I need them. It’s such a pretty herb too. There’s nothing more refreshing than a tall glass of ice water with a lemon slice and a few sprigs of mint. I also like to snip the top of a stem and add it to my afternoon tea. I came to your blog from Keeping it Cozy. You have a wonderful blog home and I will be coming back to visit often. I just began a container herb garden too in an effort to have fresh herbs to use just right outside my kitchen door. I love the herb markers you found. Thanks for sharing the Etsy link to the shop. Hopefully they will have them back in stock soon :-). I am looking forward to visiting you blog again soon! Can’t wait to see your porch. If it is anything like the rest of your home, I will start packing my suitcase now! I love growing flowers, but I am discovering that vegetables are not my thing. Herbs are a fine line and I enjoy them when I can mix them in with my flowers. What a great idea to put some rosemary in a vase! I love the smell of it, also. I planted the tiniest herb garden this year. Next year it will be bigger! Ann, I have been a lover of all herbs since I was in an herb group in about 1990. I have lots of books on them that I cherish. Nothing is more satisfying than snipping a bit for a dish you’re cooking. And insects don’t seem to like them much. My basil keeps getting attacked and chewed by something that I can’t see. SO had to buy another plant. Think I’ll change locations. 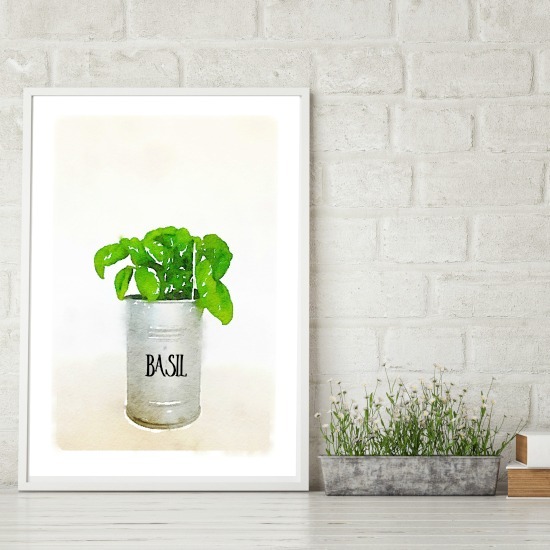 I just love the smell of basil and make pesto and bruschetta and caprese salads with it. I use my rosemary and make rosemary salt to cook with. IT’s great on chicken, potatoes, etc. I found out how on the web and I made some and gave as Christmas gifts in cute cheap glass jars from Hobby Lobby. You are indeed blessed with great outdoor sitting space. Enjoy and shall look into cooking your recipe for the chicken. Ann LOVE the black pots and the markers are adorable, they really caught my eye!! 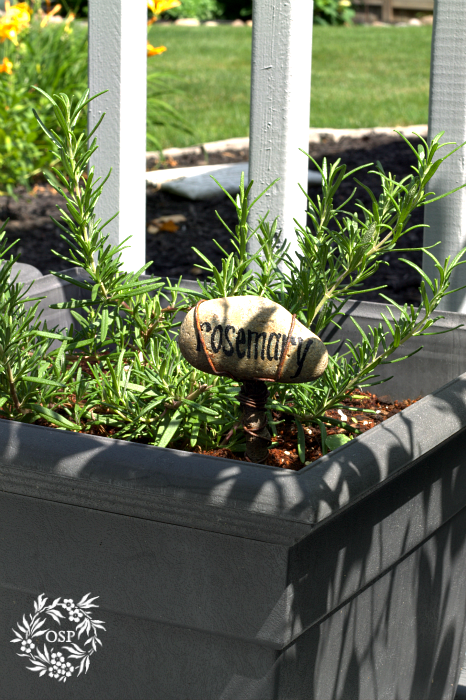 The stone herb picks are sooooo perfect for your garden. Your herbs look healthy and happy. The square black pots actually look great as they lend some order to the herb garden. I love your little stone markers too – did you make them? I bought some basil this year, but that is it. I have Italian parsley in one pot and basil in another doing well on my deck. We’re eating at home more often than at restaurants this summer. My husband’s garden has grown leaps and bounds with our steady Ohio rainfalls. Can’t wait for tomatoes, cukes, beans, carrots, peas, and my grandson Andrew’ favorite, cantaloupes.My lavender was so bountiful this year. I barely was able to cut enough for me before our every day downpour grounding my lavender. Also, I noticed a lack of bees swarming this year’s lavender. I love the thought of having herbs in containers! Mine are in the garden and they tend to get a little out of control! Everything looks so healthy and pretty in your yard and I can’t wait to see your back porch. Have a wonderful weekend! Your herb markers are so cute! I want to grow a few herbs on my kitchen windowsill. We’ll see how that goes! Ann your projects and your blog is so great. I love the gray and yellow, simple theme to your blog. You’re one of my favorites! I have my herbs planted in a container this year. Normally they would be in my raised beds, but we still have to build them. That will be a late summer project. Except for the mint. It would be in a container, because it spreads like crazy in not contained. I have used spray paint, specifically for plastic and painted faded pots before…that might be an option. Oh these look great Ann. I know you will use every last herb you can with all your baking and cooking. What a great idea!